At Washtenaw Dental, our goal is to improve the lives of our patients by providing excellency in dentistry. The connection between oral health and general health is becoming more and more apparent. In fact, good oral health has proven to help achieve and maintain better overall health and longevity of life. Washtenaw Dental is truly a family practice. Our patients range in age from pre-school to 105 years old. Yes, that’s right, you are never too young or too old to have good oral health. The secret to a healthy smile is actually no secret at all: brush, floss and get a professional dental exam at least once every six months. Professional dental exams are all about prevention – preventing existing problems from getting worse and preventing dental problems from developing in the future. Regular dental exams make it possible to identify and treat a problem in its earliest stage – which is not only good for your oral health but also good for your budget! Your teeth will be visually examined for signs of plaque, tartar and tooth decay. Your gums will also be examined for puffiness or discoloration, which are signs of gum disease. A full set of dental X-rays may also be taken during your dental exam, to enable your dentist to see below the surfaces of your teeth. 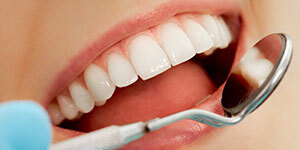 Dental exams typically end with a dental cleaning, to remove surface stains and plaque or tartar buildup. No matter how often you brush and floss, plaque and tartar deposits can still build up on your teeth. A professional teeth cleaning is the single most effective way to remove these deposits and prevent them from causing more serious problems in the future. While a traditional teeth cleaning involves manually scraping away these deposits with special dental tools, advances in dental technologies now give you more options for teeth cleanings. An ultrasonic cleaning, is a popular alternative to traditional teeth cleanings. With ultrasonic scaler is used to remove deposits, kill harmful microbes and eliminate bacteria around the teeth and gums through high-frequency sound waves. Many patients find ultrasonic teeth cleanings more comfortable than traditional teeth cleanings because they are quicker, quieter and pain-free. 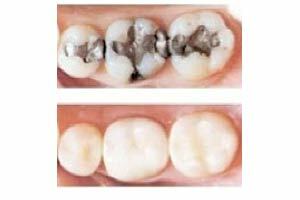 A deep cleaning may be recommended if excessive plaque and tartar deposits have developed below the gum line. Deep cleanings, also known as scaling and root planing, involve a two-part process: first, the stubborn deposits are removed, and then the root surfaces are smoothened. A deep cleaning helps prevent periodontal disease and restores gum tissues to a healthy state. If you've been told you need a dental filling, you're not alone: 92% of Americans have had at least one cavity. Dental fillings are the tried-and-true treatment for treating cavities – and they come in a variety of options to suit every need. Dental fillings can be made of silver amalgam, composite, porcelain and even gold. Composite fillings or white fillings are quickly becoming the preferred dental filling due to their natural appearance, and durability. White fillings are strong, stain-resistant, require less removal of tooth structure and do not contain mercury like amalgam fillings. Root canals get a bad rap. But don't believe the rumors; the dreaded root canal isn't dreadful at all! 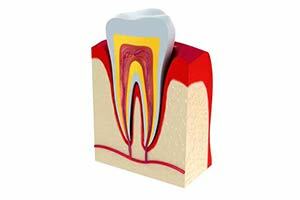 Root canals are needed when either decay or an injury infects the inner tooth (the pulp). In the earliest stages of infection, you may not feel any pain at all. But when it progresses, you could have a toothache and swelling, or a dental abscess might form. Root canals remove the infection and prevent it from spreading. Thanks to modern rotaries, root canals are faster, more comfortable and, in many cases, more thorough than conventional root canals. Pulp capping is an alternative to root canals that is used when the infection has yet to penetrate the pulp. Pulp capping is also used to prevent a large dental filling from getting too close to the nerve. A dental crown may not make you feel like royalty, but it is one of the premiere treatments for teeth which have extensive decay or damage. Dental crowns are made of ceramic, porcelain-fused-to-gold, or solid gold. Crowns are made and placed during a multi-step process. The first step is removal of tooth decay and taking a dental impression. A temporary crown is then placed to protect the tooth while the impression is sent to an offsite laboratory to create the final restoration. Dental crowns are also used to hold a dental bridge in place, cover misshapen or severely discolored tooth, or cover a tooth after a root canal procedure. With good oral hygiene your beautiful new dental crown can last up to 30 years. If you've been living with persistent jaw pain, ear pain and headaches, you could have TMJ – temporomandibular jaw disorder. TMJ can often be traced back to an improper bite, misaligned jaw joints, or an injury to the jaw or face. TMJ treatment from a dentist can relieve the discomfort. Although TMJ treatment varies from patient to patient, it typically involves one or several procedures, including the use of an orthotic splint, enamel reshaping, dental crowns, dental braces or night guards. The goal of TMJ treatment is to stabilize your bite so that your teeth, jaw muscles and jaw joints work properly together without strain – and without pain! Using dentures to replace missing teeth is not only great for your oral health; it's a great way to look and feel younger! Today, there are a variety of natural-looking and comfortable dentures for patients who need to replace missing teeth. Made of a gum-colored plastic resin or acrylic base and either resin or porcelain replacement teeth, dentures are custom designed to fit your mouth. If you have several teeth or all teeth missing on the upper or lower jaw, full dentures may be your best option. Partial dentures, which can be either fixed or removable, are great for patients who have several missing teeth scattered along the upper or lower jaw. Just as with your natural teeth, dentures require daily maintenance. With regular wear and tear, your dentures can last 5-7 years. During that time, you may need periodic denture relines to accommodate changes in the contours of your mouth. Regular denture relines involve resurfacing the base to ensure that your dentures fit and function perfectly. If you break your dentures, it's critical to bring them to your dentist for professional denture repair. Home denture repair kits can cause more damage and be even more costly to fix. Oral surgery is an umbrella term for surgical treatments such as dental implants, wisdom teeth extractions and bone grafting. Dental implants, an excellent solution for missing teeth, are surgically placed tooth roots that hold dental crowns in place. A wisdom tooth extraction may be recommended if there isn't enough room in your mouth to accommodate wisdom teeth and they become impacted, partially erupted or infected. Bone grafting transfers bone from one part of the jaw to another, usually to accommodate a dental implant. While a general dentist can perform some oral surgery procedures, an oral surgeon is required for others. Conscious sedation is a moderate level of sedation that causes drowsiness and is taken in pill form. IV deep sedation is typically administered intravenously and works very quickly. Snoring comes from the throat. It is caused when your airway becomes partially blocked. When you sleep, you relax. Your muscles and soft tissues in the back of your mouth and throat - the tongue, uvula, upper throat, and soft palate - rub together creating vibrations and noise. Obstructive sleep apnea (OSA) afflicts over 40 million Americans. Untreated, OSA can lead to heart problems, strokes and excessive daytime sleepiness. More people are killed by sleepy drivers than by drunken drivers. In its most severe form, the relaxation of the upper airway is so complete that the lungs may not receive oxygen for up to 30 seconds. In response to this deprivation of oxygen, your body triggers an internal alarm and you partially wake. This is usually accompanied by loud gasps for air that can last 3 seconds or more, until you fall asleep and the cycle starts all over again. Snoring is also affected by diet, health, lifestyle, age, weight, environment and other factors. 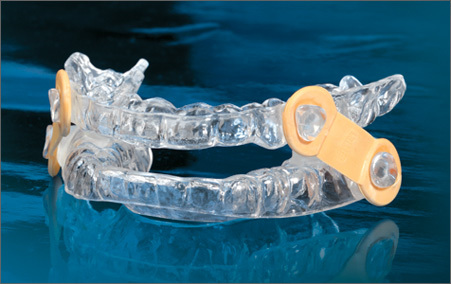 The EMA® (Elastic Mandibular Advancement) oral appliance is a customized removable appliance created for the noninvasive treatment of snoring and (OSA). The appliance is designed to both advance the mandible and open the bite to allow for less restricted airflow during sleep. The EMA® has the benefits of being easy and comfortable to wear, effective regardless of the position that you sleep in and it will work throughout the whole night. More than 5 million teeth are knocked out in sporting activities each year. While this number is staggering, the American Dental Association estimates that more than 200,000 oral injuries are prevented every year thanks to the use of PlaySafe® sports mouthguards. 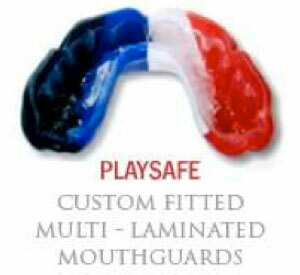 PlaySafe is the most prescribed mouthguard in the U.S., Europe and Australia. Customized to fit your mouth, statistics show that when worn properly, a protective mouthpiece decreases the risk of oral injury by 99 percent. While many sporting good stores sell mouthguards, these versions are not as effective as the PlaySafe sports mouthpiece offered by your dentist. That's because store-bought mouthguards cannot be altered and require you to keep your mouth clenched for maximum protection. PlaySafe, however, is made using an exact duplication of your mouth and will stay in place with no effort. This gives you the ability to put your attention where it belongs: on the game!